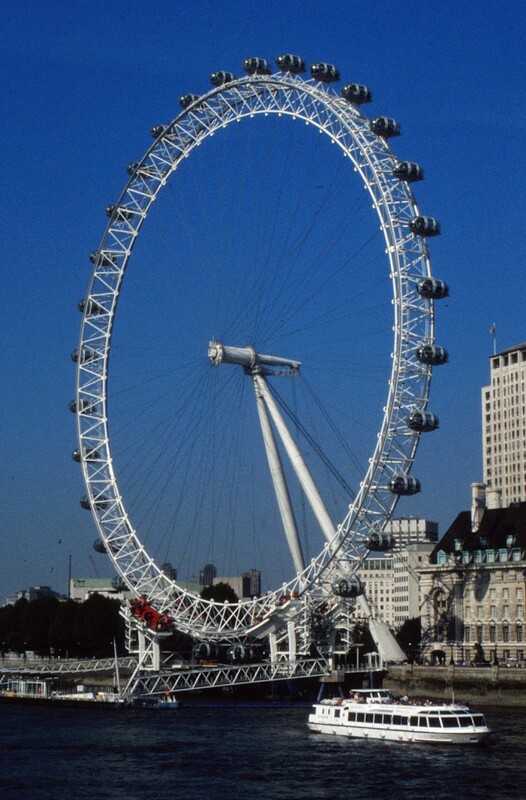 Whenever I pass the London Eye, the great Ferris Wheel on the South Bank, I marvel at its audacity and reflect that the original planning permission for its construction envisaged it would be dismantled in 2005. It was designated the Millennium Wheel, and intended to mark the start of a new epoch. Now it’s become an integral part of the 21st-century London skyline, even though it has been superseded as the tallest viewpoint by the Shard observation deck and is no longer the largest Ferris wheel in the world, an accolade successively claimed in Nanchang, Singapore and Las Vegas. The concept and the construction process were daring. The husband-and-wife team of Julia Barfield and David Marks enlisted a team of specialists to construct the components downstream and float them to the South Bank location for assembly. Manufacture was, appropriately for the period, a European enterprise, involving contractors from the UK, the Czech Republic, the Netherlands, France, Germany and Italy. Raising the wheel took two weekends. During the intervening week it was held at a seemingly precarious angle of 65° over the river. Its ceremonial opening by Tony Blair on New Year’s Eve 1999 was a deception: technical problems delayed public access until the following March. The Daily Telegraph’s architecture critic, Giles Worsley, complained in 2002 [http://www.telegraph.co.uk/culture/art/3574331/Pull-down-the-London-Eye.html] about plans to retain the Eye, as it had become known, and suggested moving it to Crystal Palace. Lambeth Borough Council, however, was never likely to reject such a successful tourist magnet on its patch. By 2015 it had had 60 million visitors, 5,000 of whom have proposed marriage during their half hour spin on the wheel. It has repeatedly changed ownership since 2000, and has been rebranded at frequent intervals. It has to make money, and it brings money to the South Bank. It’s difficult to imagine London without it. This entry was posted in Life-enhancing experiences on April 29, 2017 by Mike Higginbottom. When I grew up in the East End of Sheffield in the 1950s the streetscape was dominated, throughout Brightside, Attercliffe and Tinsley, by the forbidding black corrugated-iron sheds that housed the heavy steel industry that enriched Sheffield and Rotherham. Templeborough, just over the border from the city of Sheffield in the borough of Rotherham, took its name from a Roman fort (erroneously thought by antiquarians to be a temple) dated circa AD54. From the site on the valley floor the Romans kept an eye on the local Brigantes’ fort on Wincobank hill and, it seems, operated a small ironworks. Water-powered mills existed at Templeborough and Ickles (named from the Roman Icknield Street) throughout the Middle Ages and up to the time of the Industrial Revolution. The Phoenix Bessemer Steel Company began making railway rails on the site in 1871 but went bankrupt four years later. One of the partners, Thomas Hampton, joined Henry Steel and William Peech, businessmen and lifelong friends married to each other’s sisters, in a new enterprise. Mr Hampton was quickly superseded by the experienced steel manufacturer Edward Tozer: the new name, Steel, Peech & Tozer, became celebrated in the South Yorkshire steel industry. In 1897 Steel, Peech & Tozer replaced their Bessemer converters with open-hearth furnaces, and during the First World War erected their melting shop and rolling mills, then the largest in Europe, on the site of the Roman fort. This great works was amalgamated into the combine United Steel Companies in 1918, briefly nationalised in 1951-3 and again, as part of the British Steel Corporation, in 1967, reprivatized and renationalised and then merged with a Dutch concern to become the private enterprise Corus. Along with the adjacent Brinsworth Hot Strip Mill, opened in 1957, this huge steelworks achieved high productivity after the original open-hearth furnaces were replaced by electric-arc furnaces. When the last of these was commissioned in 1965 the works used as much electricity as the entire borough of Rotherham. As the British steel industry went into steep decline, the Templeborough mill went cold and dark in 1993, until a half-mile stretch of the buildings was converted in 2001 to a science-based educational attraction, Magna, designed by the prestigious architectural practice WilkinsonEyre, in conjunction with engineering consultancies Mott MacDonald and Buro Happold. Now this huge space, dramatically lit, commemorates the drama and magnificence of the heavy steel industry at its height, with the redundant furnaces reactivated by clever lighting and special effects to reproduce the “Big Melt” as a spectacle. By this means it’s possible to experience the entire history of steel in Sheffield and Rotherham in sequence from the modest water-powered works at Abbeydale and the Shepherd Wheel, through the interpretive displays at Kelham Island, ending at the haunting space and pyrotechnics of Magna: https://www.visitmagna.co.uk. Magna, along with the Abbeydale Industrial Hamlet, Shepherd Wheel and the Kelham Island Industrial Museum, all feature in the Sheffield’s Heritage (October 2nd-6th 2017) tour. For details, please click here. This entry was posted in Sheffield's Heritage on April 23, 2017 by Mike Higginbottom. The Dartmouth Steam Railway is part of an exceptional heritage-railway enterprise which operates as a full commercial operation, with a small amount of volunteer help at one of the five stations. The original railway, the Dartmouth and Torbay Railway, opened between Paignton and Churston in 1861 and to Kingswear in 1864. The Kingswear terminus connected by ferry with Dartmouth, where there remains a railway station that has never seen a train, like the former station at Hull (Corporation Pier). An independent branch line three miles long, the Torbay & Brixham Railway, opened from Churston into Brixham in 1868. The two railways were absorbed into the Great Western Railway in 1876 and 1883 respectively. Both branches carried heavy passenger traffic until the 1960s, when the Brixham branch closed in 1963 and most through trains to Kingswear were cut back in 1966. Complete closure was avoided when the Dart Valley Railway Co Ltd, which had been set up to run what is now the South Devon Railway between Totnes and Buckfastleigh, agreed to purchase the Paignton-Kingswear line directly from British Rail. The last BR train ran on December 30th 1971 and the first service by the Paignton & Dartmouth Steam Railway, as it was then called, began on January 1st 1972. The £250,000 cost of the purchase was balanced by the sale of surplus land, including a hotel in Kingswear, and astute management has kept pace with demand from holidaymakers as well as rail enthusiasts ever since. While the Dartmouth Steam Railway has developed as a commercial enterprise, the former Dart Valley Railway, now the South Devon Railway, has remained a volunteer operation, successful enough to purchase the freehold of its trackbed and premises from the Dartmouth Steam Railway PLC in 2010. There’s more to the Paignton-Kingswear railway than trains. As the Dartmouth Steam Railway & Riverboat Company it runs a fleet of river boats between Kingswear and Dartmouth, and between Dartmouth and Totnes, and its vintage bus service no 100 connects Totnes Quay with the rebuilt GWR-style railway station at Paignton (Queens Park) so that, tide permitting, it’s possible to make a full circuit within the day. The railway also opened Greenway Halt in 2012, providing direct access to the Agatha Christie estate, Greenway, a National Trust property. The combination of glorious seaside, heritage transport and the beauty of the River Dart and its estuary make the Kingswear peninsula a magnet for visitors. All this is accessible by means of the Round Robin ticket [http://www.dartmouthrailriver.co.uk/tours/round-robin], as well as a variety of other options to suit individual visitors’ inclinations. 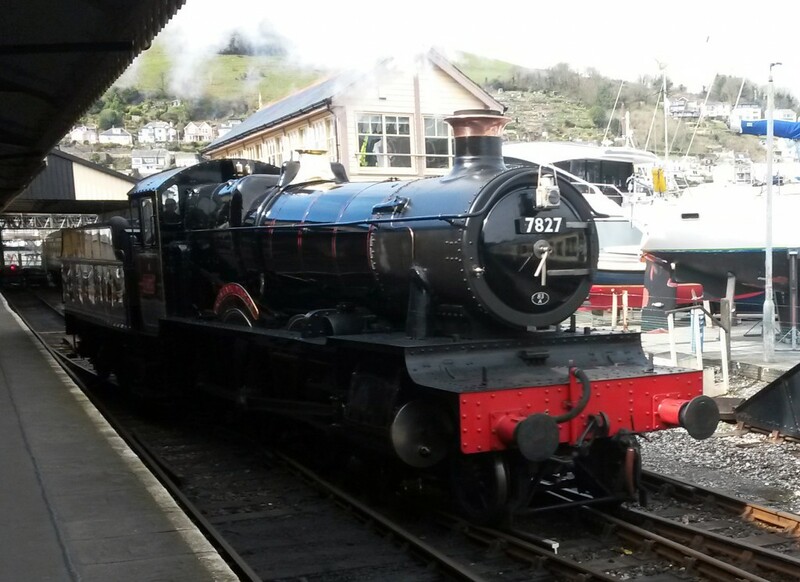 The Railways of Devon (June 12th-16th 2017) tour includes a visit to the Dartmouth Steam Railway as part of a rail, bus and riverboat Round Robin tour of the Dart estuary. For further details, please click here. This entry was posted in Life-enhancing experiences, Railways of Devon, Transports of Delight on April 11, 2017 by Mike Higginbottom. Dr Richard Beeching could open the heritage railway then called the Dart Valley Railway with a clear conscience, because it was not one of the railways that his now notorious Report had closed. The branch line from Totnes to Ashburton, opened in 1872, had never made a worthwhile profit. The company that built it, the Buckfastleigh, Totnes & South Devon Railway, eventually sold out to the operator, by then the Great Western Railway, at a huge loss in 1897, and by the 1930s the three stations were between them selling less than twenty tickets a day. The last passenger train ran on November 3rd 1958 and freight continued until September 1962. Although Dr Beeching had been appointed Chairman of the British Railways Board in 1961, the first of his two reports, The Reshaping of British Railways, came out in 1963. Dr Beeching returned to his substantive post at ICI in 1965. The branch line reopened as the Dart Valley Railway in April 1969. Because service trains had always used the main-line platform at Totnes station, rather than a bay platform, access to heritage trains at Totnes remained a problem for years, until the specially constructed riverside station short of the main-line junction, Totnes (Littlehempston), was linked by a pedestrian footbridge in 1993. Since 1991 this charming little line has been operated by the South Devon Railway Trust. It carries far more passengers – around 100,000 a year – than it ever did as a commercial railway. In the early days, until 1971, the Dart Valley Railway trains operated all the way to Ashburton, but an upgrade of the A38 trunk road blocked the trackbed and the terminus ever since has been Buckfastleigh. 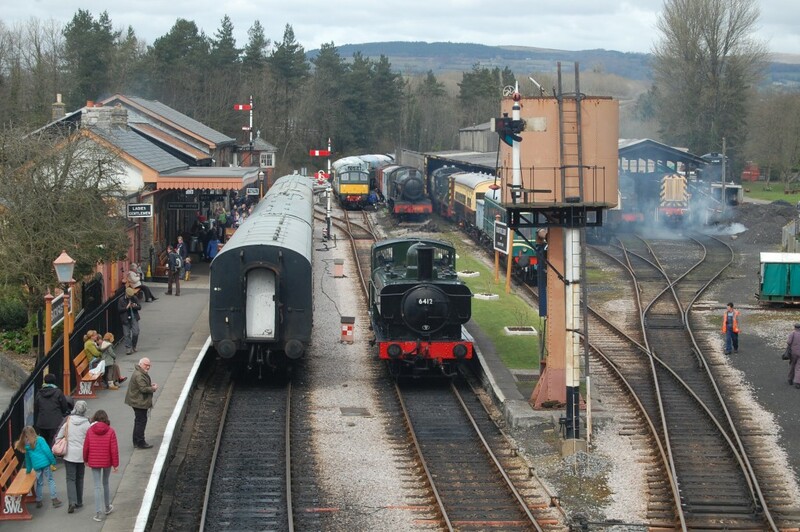 That might seem to be the end of the matter, but Ashburton station remains intact, and the Friends of Ashburton Station [https://friendsofashburtonstation.co.uk] have put forward a business case for retaining the station’s environs and restoring the rail connection with Buckfastleigh. Their report itemises nine such unlikely reinstatements, ranging from the Ffestiniog and Welsh Highland Railways to the linking of the two Great Central Railway lines at Loughborough: http://www.dartmoor.gov.uk/__data/assets/pdf_file/0011/549983/FoAS-Proposal.compressed.compressed.pdf. The South Devon Railway Trust has committed to supporting this venture, though the process of enlisting local community support is delicate: https://www.facebook.com/groups/ashburtonstation (see January 16th 2017 post). The chairman of the Trust, Allan Taylor, provided a statement of his board’s position under the heading ‘Background information’ at http://everythinggwr.com/save-ashburton-station. In the meantime, on high days and holidays, there is a rail replacement bus service between Buckfastleigh and Ashburton: http://www.rm1872.org.uk. The Railways of Devon (June 12th-16th 2017) tour includes a visit to the South Devon Railway. For further details, please click here. This entry was posted in Railways of Devon, Transports of Delight on April 5, 2017 by Mike Higginbottom.